The Spanish conqueror and explorer Juan Ponce de León conquered the island of Puerto Rico and explored the coastline of Florida, which he claimed for the Spanish crown. Juan Ponce de León was born in San Servas, Spain. Although born into a noble family, he was poor, and like many in similar situations, he sought fame and fortune as a soldier. He received an education in fighting skills, manners, and religion while serving a knight named Pedro Nunez de Guzman, and later helped in the ten-year conquest of the Muslim kingdom of Granada in southern Spain. Afterward, Ponce de León heard stories of Christopher Columbus's (c. 1451–1506) discovery of a new world and volunteered to go along on a return trip. In September 1493 he was one of twelve hundred men who set out for the island of Hispaniola (modern Dominican Republic and Haiti). Ponce de León survived disease, bad weather, and a shortage of food and drink to help colonize the new lands by forcing the Indians into slavery. Ponce de León spent most of the early 1500s in Hispaniola, establishing farms, distributing land rights, helping construct buildings to aid in defense, and working to set up an island economy (system of production, distribution, and use of goods and services). He also married and fathered four children. He was named deputy governor of Hispaniola by Governor Nicolas de Ovando after helping put down an Indian uprising in the eastern province of the island in 1504. The Indians told Ponce de León that he would find gold on a neighboring island to the east, called Boriquien (Puerto Rico). Four years later he crossed over and conquered the island. During the conquest he shared the honors with a famous greyhound dog named Bercerillo. It was said that the Indians were more afraid of ten Spaniards with the dog than one hundred without him. Ponce de León was appointed governor of Puerto Rico by King Ferdinand of Spain (1452–1516). The island became popular with other settlers because it was well run by Ponce de León and it had a large number of slaves and many natural resources. Ponce de León was also noted for his nonviolent treatment of the Indians, which was rare for the time. Stripped of his title as governor by King Ferdinand in 1512 after a political conflict, Ponce de León obtained permission from the king to discover and settle the island of Bimini, which was believed to lie somewhere to the northwest. He was also interested in locating a famous body of water that was said to have the power to restore youth to the aged. This myth, repeated to Ponce de León by the Indians, was of European origin. According to the legend, the spring was in the Garden of Eden, which was located somewhere in Asia (the early Spaniards believed America to be Asia). In March 1513 Ponce de León sailed from Puerto Rico and a month later anchored near the mouth of the St. Johns River on the northeast coast of Florida. Impressed with its many beautiful flowers, and having landed on Easter day, he named the land Florida, from the Spanish Pascua florida, or "flowery Easter." While traveling southward he encountered the strong current of the Gulf Stream as it poured through a channel. He had discovered the Bahama Channel, which later became the route of the treasure ships on their return voyage to Spain. He continued exploring the East Coast and then sailed up the Gulf Coast to Pensacola Bay. During his return voyage to Puerto Rico he sighted several small islands crowded with tortoises and named the islands the Tortugas, or "tortoises." In 1514 Ponce de León returned to Spain where he received another grant, to establish colonies in the "Island of Florida" at his own expense. In February 1521 the colonizing expedition landed on the Florida coast near Charlotte Harbor. A fierce attack by Native Americans caused the settlement to be left abandoned. Ponce de León, wounded in the battle, died a few days after returning to Cuba. He was buried in Puerto Rico; the words on his gravestone read, "Here rest the bones of a valiant LION [León], mightier in deeds than in name." Dolan, Sean. 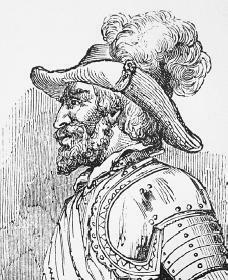 Juan Ponce de León. New York: Chelsea House, 1995. Fuson, Robert Henderson. Juan Ponce de León and the Spanish Discovery of Puerto Rico and Florida. Blacksburg, VA: McDonald & Woodward Publishing Company, 2000.
im writing a report but this isnt enough info. i need more.did he even have a wife or more discoverys. HE DID NOT DISCOVER PUERTO RICO, IT WAS CRSTOBAL COLON. This needs more information. I'm doing a project for school and I have this person and i need to know who was his family and it needs more pictures and more information. He did discover Puerto Rico with help from Christopher Columbus. Y'all may not believe me on this but he is my 7th great grand father. Even though this article isn't much help there are always more sites to look at. Wonderful info. But, I would add more paragraphs for kids and Adults.